Just like fashion, software design trends shift around all the time. Those of us in the tech industry might like playing with shiny new toys, but after working with small businesses for almost 10 years, I can say definitively that the average business person dreads the word “redesign”. At best, a redesign means learning a new interface when the old one worked just fine. At worst, it means that the company is trying to fundamentally change what they do and who they’re serving. Too often, redesigns are about getting new customers at the expense of the old customers. I get it, and I agree. Business software is meant to be a tool, not a toy. Tools exist to solve problems, and treating the design like a fashion show doesn’t do anything to solve problems better. It’s for this reason that LACRM hasn’t had a major redesign since 2012. Sure, we’ve tweaked some things here or there, but the core look and feel of our software has been going strong for over six years. But sometimes design is about more than just fashion. Design is a critical aspect of functionality, and it has always been one of the main things that set LACRM apart from our competitors. Why is LACRM easier to set up than other CRMs? Design. Why is it easier to teach to a new employee? Design. Why is it easier to continue using it? You get the idea. Even though our design hasn’t changed much over the last six years, the rest of the world has. Smartphone usage has exploded, and there are more and more people who don’t even use a computer at their job anymore. Web-based software has become more critical to most businesses’ operations. Computers have gotten faster, and screens have gotten bigger (and smaller). Less Annoying CRM as a company has changed too. In 2012, we were a three-person company. My brother and I were the only programmers, so we built everything ourselves. Now, in 2019, we have 17 employees including seven programmers. Our product is significantly more mature, our team is capable of tackling bigger problems, and so we’re starting to set our sights on improvements to LACRM that we could only dream of six years ago. As much as we pride ourselves on offering such a reliable and consistent experience to our customers over the last six years, enough has changed about the world and our company that our current design is starting to become a problem. So it’s time for us to bite the bullet and say the dreaded word: we need a redesign. What are the specific problems with the current design? If I’m doing my job, we should all agree that Less Annoying CRM is “simple”. But what does simplicity actually mean? In my opinion, we should measure how simple a product is by looking at how much easier it makes a user’s life. This is a bit counter-intuitive, but sometimes adding complexity to a product actually makes the user’s life easier. For example, a long time ago LACRM didn’t have a calendar (no tasks or events). Our customers had to switch back and forth between the CRM and other tools, and reminders couldn’t be linked to contact records. By adding these features directly to LACRM, we made our product more complex, but we made our users’ lives easier. So adding complexity made things simpler. We work hard to avoid the bad kind of complexity. The kind where everything gets harder and less intuitive. But as we improve LACRM, it’s only natural that we add some of the good kind of complexity. When we designed the current version of LACRM six years ago, we didn’t understand all the things we’d be adding over the years, and now we’re starting to hit limitations with the current design. It’s harder and harder to improve the software without adding the bad kind of complexity. We need a redesign. When we originally built LACRM, it really only had a few features. Every “page” we needed used basically the same type of design. But over time we’ve added some things that don’t fit into that design very well. For example, if you have a wide computer screen and you look at the calendar, wouldn’t you prefer for it to take up the entire screen instead of having a maximum width like it does now? Our current design doesn’t allow for different pages to have different widths because the width of the screen is linked to the width of the navigation bar at the top. We have big plans for the future. There are countless improvements we want to make to the CRM itself, and we also plan on building new products in addition to the CRM (all accessed from one simple app). Our current design isn’t meant to handle some of the things we want to add in the future. We need a redesign. When we originally designed LACRM, it was safe to assume that anyone using it was sitting at a desk in front of a computer, and that the screen of that computer would be a predictable size. Now, a significant number of our customers are using it from smartphones and tablets. We have a mobile version that works well on a phone, but it’s very limited. Wouldn’t it be great if our main software could run on small screens? We need a redesign. How will the redesign solve these problems? Note: We’re still working on the final design which is why I’m just sharing a rough sketch here. The main problem with our current design is that our navigation menu (the bar that runs across the top of the page) is too limiting. It’s currently split between two lines (one with “Add a new contact”, etc. and one with “Your Workspace”, etc.) which causes lots of design problems -- and because it’s horizontal, it doesn’t work as the page becomes narrower on small screens. In the new design, the navigation will be vertical instead of horizontal, and it’ll be pinned to the left side of the screen. 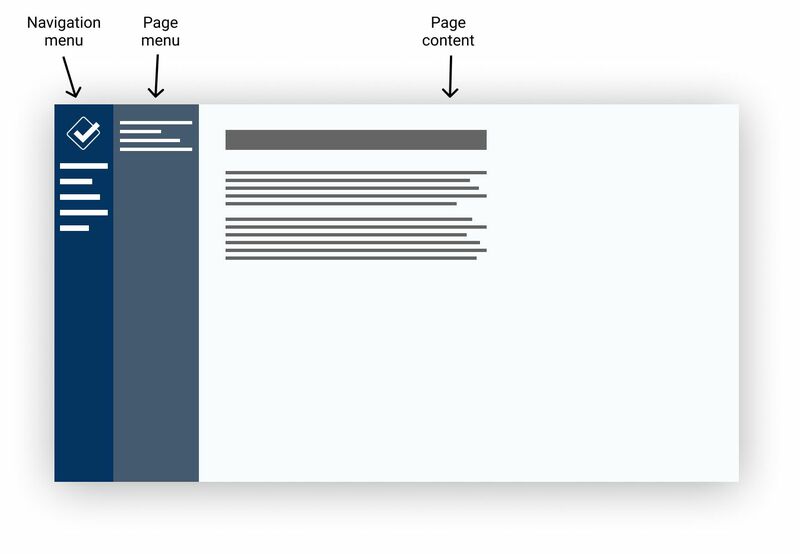 You’ll always be able to see it even if you’ve scrolled down on the page, and because it’s off to the side, it won’t impose any constraints on the layout of the main page content. This is related to the “complexity” problem described above. In the past, as we’ve added additional features, customization options, etc., we just threw them wherever they would fit on the screen. This means that there’s not really a consistent place to find options on a page. With the new design, every single page is going to have a “menu” sidebar on the left. This is where we’re going to put all the non-primary options. For example, on the “Find a Contact” page right now, there are a bunch of options for filtering and sorting your contact list. In the new version, the main content will just show your list of contacts without all the clutter of those filters. The filters will all be found in the page menu. This way you’ll always know where to look if you want to see what your options are on a given page. This is the part you actually care about, and the good news is that not much will change here. Whether you’re viewing a contact, checking your calendar, or pulling up a report, the main content you’re trying to see will appear in this section. But because the navigation menu is on the left now, this section can be whatever width is best. Some pages will be narrower than they are now (e.g. the “Find a Contact” page doesn’t need so much empty whitespace) and some pages will be wider (e.g. the calendar will take up the full width of the page). Also, because all of the extra features can be found in the page menu, the page content section will be cleaner and more streamlined. It’ll be easier than ever to focus on what you actually care about without the distraction of additional features. More importantly, what won’t we do? Hopefully everything I've covered so far makes sense. There are problems with our current design and we are working on a redesign that will address those problems. But all too often tech companies are so fixated on accomplishing their primary goals that they ignore all the collateral damage they do along the way. We don’t want to be that way. Yes, it’s important that we continue improving and moving our product and company forward, but we don’t want to do that if it comes at the expense of our current customers. That’s why we’ve imposed some constraints on ourselves to make sure that we don’t lose our way with this project, or with any projects yet to come. I’ll admit that after staring at the same design every day for six years, sometimes I think it would be fun to just mix things up. But I know that’s bad for our customers, and I’m committed to never doing that. Everything we change with this redesign will have a reason. If we’re going to ask you to learn a new interface, we’re going to be 100% sure it’s worth it. Almost everything we do at LACRM is iterative. We prefer consistently releasing small, gradual improvements instead of having massive releases. Generally speaking, iterating is the right approach, but that’s not true with redesigns. Every time there’s a significant change to the overall design, customers are disrupted. So for this specific project we’re going to do our best to roll all of our good ideas into one big update and we’ll release it all at once. That way you should only have to figure out a new interface once. Of course we’ll continue improving our software iteratively after the redesign is complete, but assuming we haven’t horribly misjudged things, we don’t expect there to be anymore major design changes for a long time. Every time we change something about LACRM, we’re making a commitment not just to support the software, but to support you, the customer. It’s not your job to figure out what we were thinking with this redesign. This blog post is the first of many communications we’ll be preparing to help you understand what we’re changing, why, and how you can benefit from it. And if the blog posts and videos we make aren’t enough, we always provide unlimited free one-on-one phone support. So if you need any help at all making the adjustment, we’re here for you. Less Annoying CRM has always been dedicated to serving small businesses, and that’s not changing. I find it really disappointing how many tech companies start out selling to small businesses and then gradually “move upmarket” as they grow. Small business owners tell me all the time how hard it is to buy software because as soon as they find a company they like, that company jacks up their prices, slashes customer service, and starts focusing on “enterprise” sales. When I talk to other startup founders, sometimes they’re surprised to hear some of our numbers: we’ve been in business for almost 10 years, we just hit our 20,000th paying user, we have 17 employees, we’re profitable, and we’ve done all that with absolutely no outside investment. But there’s one number that amazes people more than anything else: our average account only has 2.3 users. That’s unheard of in the software industry. It’s supposed to be impossible to build a profitable business selling low-priced software to such small customers. Well, that’s all we know, and it’s all we’ve ever known. With this redesign of LACRM, we’re doubling down on our commitment to the smallest of the small businesses. We’re not going anywhere, and I hope you all are as excited about the future of LACRM as I am. If you have any questions or comments, please feel free to reach out to me at tyler@lessannoyingcrm.com.